Free Novosoft Office Backup Professional Download from FilesPack.com! Novosoft Office Backup Professional Version is professional backup software which allows doing quality backups of digital data stored on office computers and corporate networks including hard drive images and ODBS-compatible databases such as MySQL, Oracle, FoxPro, Interbase, MS SQL, DB2, MS Access, Postgre SQL etc, and recording it to CD, DVD, Blu-ray, HD DVD, FTP/SFTP, external drives. It provides maximum protection of office computers safeguarding business data from loss and theft. A simple and intuitive task creation wizard takes the user through the whole process of backup and recovery, providing useful tips at each step of task creation. 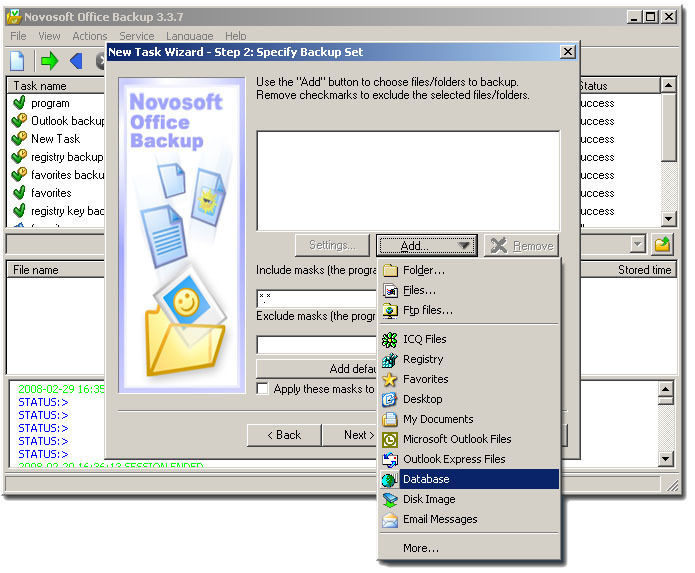 Other features of Novosoft Office Backup Professional Version include two backup modes: standard ? for quick backups, and expert ? for a more specific task adjustment, task scheduler which allows performing backups automatically on a specified time with a minute accuracy, file selection tools such as mask and extensions filters, 9 levels of zip compression, 128-bit blowfish encryption and backup via SFTP, which guarantees data security during storage and transfer, backup with file versions and timestamps to keep track of all file modifications. In addition, the program allows running backup tasks in a Windows service mode, which means multiple users can run backups on the same computer not interfering with each other. The program can operate under Vista, Windows 2000, Windows XP, and Windows 2003. It has minimum download and setup time, and consumes very little system resources. While running, the program does not interfere with other programs and applications. You can free download Novosoft Office Backup Professional 3.3.7 now.